Gong Bath Meditation in North Finchley, London N12 in support of Nepal. All proceeds will be donated directly to where it is needed. ONLY 10 Spaces! Having been deeply shocked and devastated by the earthquake in Nepal I wanted to do something so please join me for a deeply relaxing healing gong meditation where I will focus on sending love, healing and support to the people in Nepal. Join me for a one hour sound journey to relax and de-stress. Please bring a yoga mat or similar to lie down and a blanket and cushion or pillow for maximum comfort. It is a lovely small and cosy venue in North Finchley which I have for the evening, free of charge. We only have 10 spaces so I am asking for £5 deposit be paid in advance to secure your space and ask that you please give generously on the night. I would usually ask for £15 for a gong bath meditation so please donate any extra that you would like to on the night to support this worthy cause. Odette has attended training workshops with Sheila Whittaker, Don Conreaux, Abby delSol and Tom Soltron. She will be furthering her gong journey in July 2015 with Gong Master Training in Poland with Don Conreaux, Abby delSol and Tom Soltron. 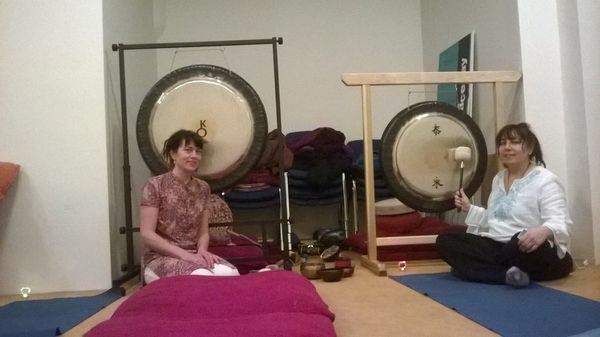 Thats a pic of me and my friend Michelle at a previous Gong Bath. This time you will have just me!